Today, I am taking a giant step... So long, I have been content to stay in the shadows allowing my words and photos to paint a picture of me and my kitchen, safely ensconced in the security of their relative anonymity. But today, I am peeling back this veil and inviting you to see me .. in action. If ever there was a pun that would be it! :) This is the first ever video post on this site! For my debut appearance, I went back to my roots, South India. 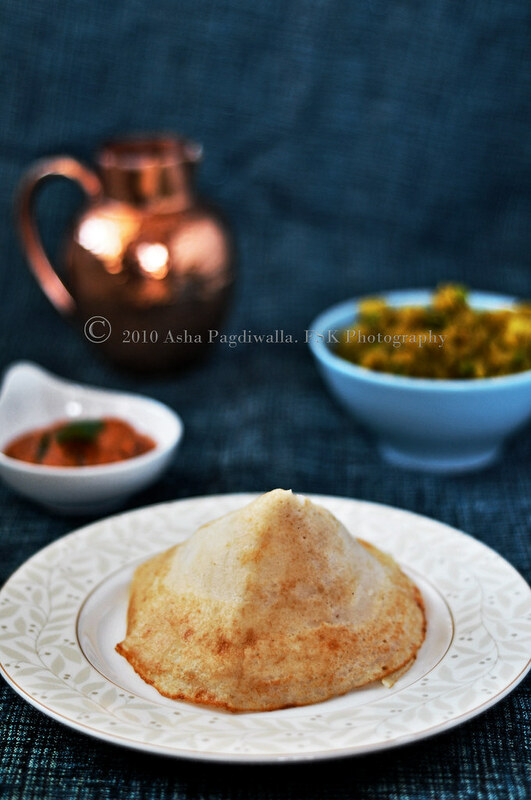 I wanted to share with you a dish that I grew up with; Dosa, a favorite that I can eat any time of the day and is a true comfort food, especially when someone else makes it for you! :D. Another reason, I chose to showcase the dosa technique is because it is versatile and you can also make sweet crepes using the same technique. Depending on the region of Southern India, a variety of dosas are enjoyed; from paper thin ones to thicker pancake like ones (uttappams, adais etc. ), plain or masala filled ones and even some topped like pizza with vegetables and meat. In its simplest form, the dosa is a gluten free Indian savory crepe made using a fermented batter of rice, urad lentils (split white lentils) and a pinch of fenugreek seeds. From there, the kind of dosa made depends on the technique of swirling (or not) the batter on the pan. Even people in the same family make different versions depending on skill and preference. I prefer the thin, crispy varieties. Much like crepes, it takes technique and some practice to get it right. But, it is so totally worth it! Note: The fenugreek helps in bringing about the deep golden brown hue of the dosa. 1. To make the batter, soak the ingredients for atleast 4 hours (preferrably overnight) and grind them to a smooth paste using as little water as possible. 2. To help fermentation during the colder months, you can place the dough inside an off oven. You can also add yogurt to the batter to help the fermentation. 3. Do not add salt before fermenting the dough; it will inhibit it. Once you have consistency of batter you want, season appropriately. 4. For a thin dosa, the batter has to be runny and of pourable consistency. For a dosa cake, you can use the original batter or thin it down slightly. 5. Using a ladle with a flat bottom will really help in spreading the batter evenly. 6. Make sure the pan is sizzling hot and on medium-high heat before you ladle the batter on to it. An easy way to test is to drip a drop of water onto the pan; it should sizzle and dance on the surface. 8. One trick to prevent batter from sticking to the pan I picked up from my mom, is to use dip a half onion in oil and rub the pan with it just before pouring the batter on it. 9. 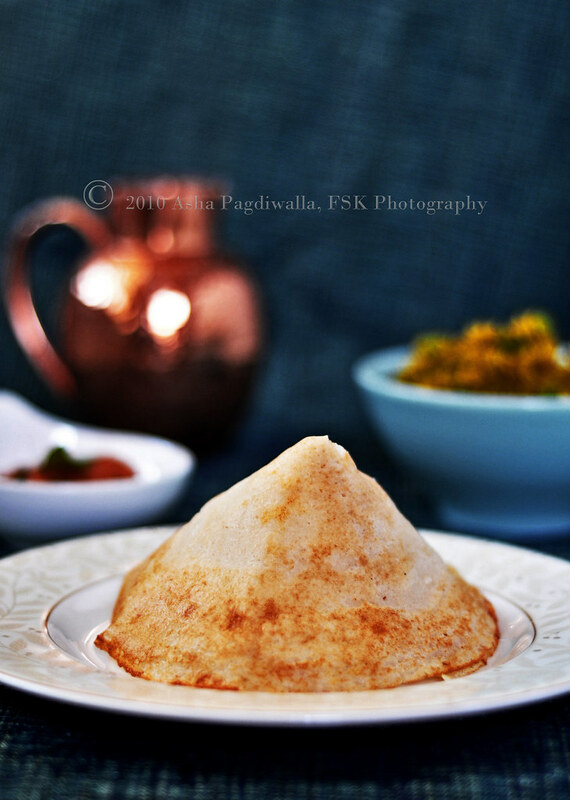 The dosa can be eaten with any side - chutney, vegetables, curries. My favorite is with spicy mutton curry.. Oh YUMM! 10. You can refrigerate any remaining batter for upto a week. If you find the batter too fermented, then you can either add some semolina to it and make regular dosas or mix in thinly diced vegetables and cook into a thicker cake. Thank you Foodbuzz for choosing this mode for the challenge. I immensely enjoyed making the video while pushing Mr.FSK, my cameraman, to the limits of his patience with my directing (in)capabilities. :D It was a huge learning experience, indeed! I am excited, thrilled, intimidated and nervous to be presenting this entry to you, dear reader. Thanks very much for your patronage so far in this contest. I hope you find this entry virtuous enough to vote me through to the next round! :) Voting opens on Nov 15. Soak rice, dal and fenugreek seeds in enough water for atleast 4 hours to overnight. Change the water a couple of times in this period. Grind into a smooth paste using as little water as possible. Leave covered in a bowl in a warm place to ferment overnight. Mix the fermented dough well to make a smooth batter. In another bowl, add some water to thin out the batter to a runny consistency. Meanwhile, heat the pan over medium-high heat. The pan is ready when it sizzles when a drop of water touches it. Ladle out about half cup of water on the pan and use gentle circular movements with the ladle to spread the batter into a thin circle. Drizzle oil along the edges and center. When the edges brown, crisp up and lift off slightly from the pan, slide a spatula under the dosa gently and flip it over. Cook on the other side to golden brown, about 30 seconds. Transfer to plate. Saute the onions and tomatoes until cooked. Puree into a smooth mixture. Let cool. In a shallow pan, heat the ghee and add all the tadka ingredients and cook over low heat until the mustard seeds start popping. Remove from heat and spread over the onion-tomato puree. Roast the mustard, cumin, curry leaves and urad dal until the mustard starts popping. Saute the onions and garlic in oil until soft. Add the green chillies and turmeric and saute for a minute. 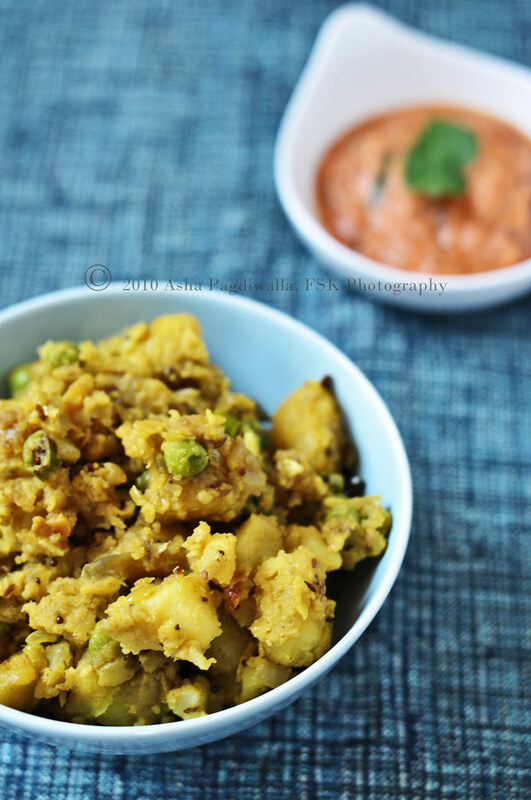 Add potatoes and peas, sprinkle some water and cook for 5-10 minutes until the flavors blend.